If you’re not going to be the only person maintaining your Google+ page, you’ll want to add others as managers to help your social media marketing campaign. Google allows you to have up to 50 of them! There can be only one owner of the page, however. The owner is the only person who can delete the page or transfer ownership of the page to another individual. Managers, on the other hand, are individuals who have permission to make changes to your account information such as updating your tagline or web address as well as post content. It’s a good idea to have more than one manager just in case someone is not available to sign in for whatever reason. That way your Google+ page won’t be silent! Maintaining a social network for a brand is an important responsibility. Be sure the people you appoint for this task are up for the responsibility because everything they post on your behalf reflects you, your business, and your brand. Be sure your managers are aware of the type of comments and content you consider acceptable. You arrive at your Google+ Settings page, which also happens to be the name of the default landing tab. Click the Managers tab at the top of the page. You see a list of the managers you have and the role they play. Your profile is at the top of the list with the word Owner next to your name. 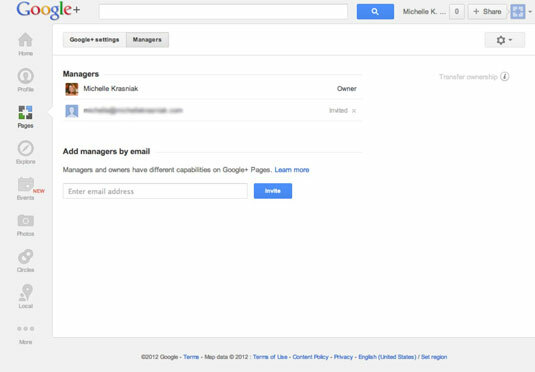 Enter the e-mail address of the person you want to invite to be a manager of the page and click the Invite button. You see a box that asks you to confirm your invite. Click the Invite button to send the invitation. After you invite the person, he or she is automatically added to the Managers list. However, the page displays Invited next to the name until the invitation is accepted. At that point, Invited changes to Manager.